In this podcast, Sean Corkery sat down with Joe Barry, Pat Barry, and Kate Alves to discuss the trends we saw in 2018 and what our expectations are for 2019. Additionally, we reflect on how today’s price action compares to past moments of market unrest and share the “golden rules” of value investing that guide our approach. Sean Corkery, CFA® and Joe Barry, CFA® discuss the state of U.S. and international equity markets. This conversation covers volatility, the interest rate market, the fundamentals of U.S. verse international investing, and political risks which exist within the market in 2018. One of our “can’t miss” reads is Saturday’s session with Barron’s, the weekly financial magazine. In a recent edition, Vito Racanelli penned the cover story titled, Europe on Sale: Time to Buy Foreign Stocks. In the article, Racanelli contends that overseas markets are cheaper than U.S. markets and with an improving economic backdrop, are poised to outperform. As global value investors, we are naturally interested in the author’s findings and thought it was appropriate to share the highlights and our views. The S&P 500’s long-term dominance over the European indices may be about to end. Future outperformance will likely be driven by profits. Corporate earnings of companies in the EAFE Index (index of developed markets outside the US and Canada) remain 45% below the prior peak, while S&P 500 companies’ earnings have far exceeded 2007 levels. Furthermore, with higher fixed costs, EAFE companies have higher leverage to revenue growth: a 1% gain in revenues produces a 2.8% increase in profits, while a 1% gain in revenues at U.S. companies translates to a 1.8% jump in earnings. 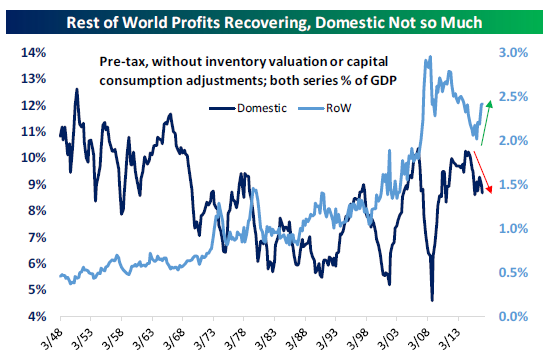 It is worth noting that in Japan, the 1% revenue gain translates to 3.6% of profit growth. Despite the impressive 2017 performance of the EAFE Index, valuations remain very attractive. Based on estimates, its price to earnings ratio (P/E) is 15.3 and the Dividend Yield is 3.2%. The S&P 500 has a P/E of 18.2 and a Dividend Yield of 2.0%. Historically the U.S. premium to the EAFE index P/E has been 1.0-1.5, well below the current 3.0. Optimism for the global economy has clearly been rising. Starting with Europe, key economic indicators have been flashing green with improvements and surprises to the upside since the summer of 2016. The Purchasing Managers’ Index (PMI), a surveyed indicator of economic health, reached the highest level in the last three years for Germany, France and the Eurozone. The Eurozone Manufacturing PMI posted nine consecutive months of increases and reached the highest level since April 2011. Unemployment in the Eurozone has improved to 9.5% from 12.1%. In May, the European Central Bank (ECB) took notice, lifting its domestic GDP growth estimate to 1.7% from 1.6%, and set 2018’s estimate at 1.8%. Risks were considered more balanced following the defeat of populist parties in France and the Netherlands. In Asia, the Bank of Japan (BOJ) increased their domestic Gross Domestic Product (GDP) growth estimate from 1.5% to 1.6% and more importantly, stated that the economy is expanding rather than recovering. First quarter corporate earnings showed noticeable year-over-year improvements. With China, we believe investors are underappreciating the power of the thriving middle class in China, with median incomes growing and consumerism representing a growth megatrend. On a global basis, for the first time in six years, earnings estimate upgrades outnumbered downgrades. The Global GDP growth rate is projected to grow to 3.2% this year, up from 3.0% in 2016. While minor in absolute terms, we appreciate the positive direction of economic growth. In May, market volatility picked up due to political concerns. While it is difficult to predict when it will strike again, we believe having a globally-diversified portfolio coupled with gold and alternative investments is the best strategy for a risk-balanced portfolio. We remain disciplined in our approach to finding worthy investment opportunities, with a laser-like focus on downside protection. 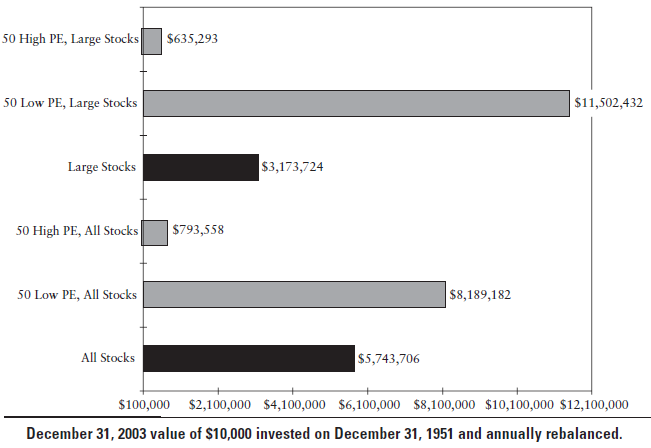 As long-term value investors, we trust patience will be rewarded. Thank you for your continued confidence in us. A new Department of Labor rule will raise all financial professionals who work with retirement plans or provide retirement planning advice to the level of a fiduciary, effective June 9, 2017. As an independent advisory firm, The Barry Team has always put our clients first and acted in a fiduciary capacity. This ruling will have a minimal impact on clients of Barry Investment Advisors. What to make of 2015? It was a year of global transitions. One where the Federal Reserve moved away from its zero interest rate policy to a rate raising cycle and handed off the stimulus baton to Europe. There was a shift to a world with potentially much lower oil prices than almost anyone expected, a time where multinational companies had to adjust to lower Chinese economic growth rates and an inflated value of the U.S. currency. It was also a year where the prices of the riskiest bonds that had historically offered higher yields fell in value to reflect their inherent risks. Even long-term U.S. government bonds were down in price as the long anticipated China sell down occurred. China unloaded hundreds of billions of them to help offset investment outflows. This had much less of an impact on prices than investors expected. While it never feels good when the market is moving against us, it is helpful to revisit why we are value investors and review our principles as well as relevant lessons from the past. The fact that we are unwilling to pay for a company that is clearly priced over 20 times their profits helps us avoid steep losses, because there are additional downside risks in overpaying. While diversification is a good practice, there are years like 2015 where one can be tempted to increase investment in the areas that have continued to go up. History reminds us that keeping our diversified long-term value oriented strategy in place is advisable and to expect cycles in the markets to continue. We should be ready for out-of-favor areas that we are invested in to come back into favor, and not be surprised when the best areas in recent past lose their luster. Global investors set expectations about economic growth and the markets often adjust based on what ultimately happens. What is also important is the direction growth is headed. Europe, Japan, and the Emerging Markets economic growth rates are expected to continue to improve, while the U.S. is expected to decelerate. With the combination of better valuations, continued stimulus, lower energy prices, and improving earnings of economies outside the U.S., we expect to be better off continuing to allocate portfolios globally. Even so, we won’t rule out a positive 2016 in the U.S. markets, in spite of its rocky start. The next chart shows that down moves in the stock market happen regularly, and yet, they don’t have much bearing on how well the year turns out. 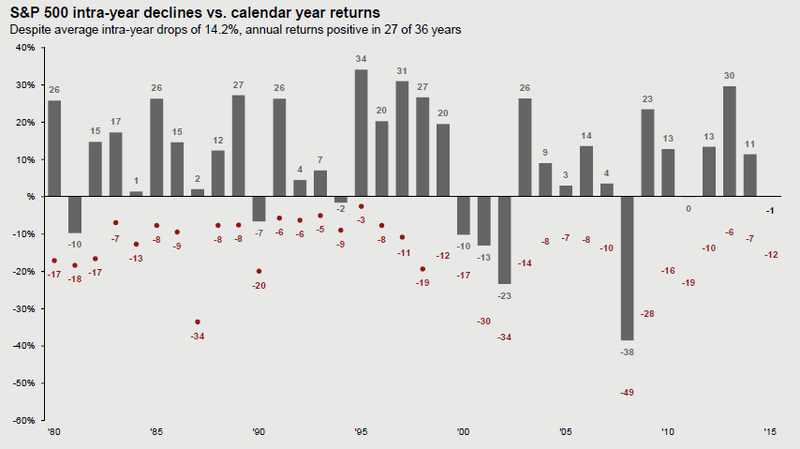 The red dots show the largest market drop occurring in each year and the solid bars reflect the gain or loss the market experienced for the calendar year. Currently we have found that diversification, as well as keeping some cash reserves, is the most effective way to manage volatility. We continue to research ways to reduce it. So how do we adjust our sails? As much as we like to think in one year periods, we need to keep in mind that markets and trends tend to shift over longer periods. It’s our ability to be patient, but also to adjust, that will determine how well we do over time. 2015 reminds us to be cautious of the risks out there and to continue to select carefully. The current market environment will provide opportunities to put more cash to work. Additionally, if interest rates rise in 2016, we won’t rule out owning more U.S. government bonds. Markets are full of surprises. We are keeping our eyes on the many trends that are emerging in technology and healthcare et al., and will continue to recommend areas that look promising, but also are fundamentally sound. When change happens, we have to be ready to adjust accordingly. 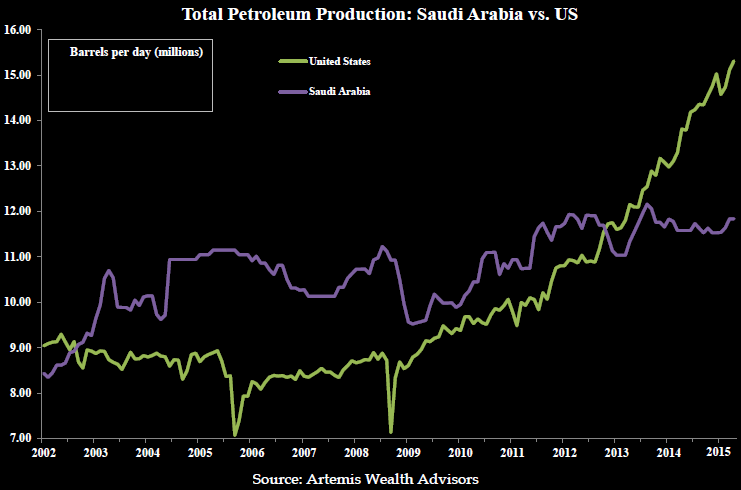 For example, who would have thought the U.S. would be producing more energy than Saudi Arabia? We are fundamental value investors because value investing has shown us to be the most reliable approach to grow portfolios over the long term. Your team looks forward to navigating you through 2016 and beyond.